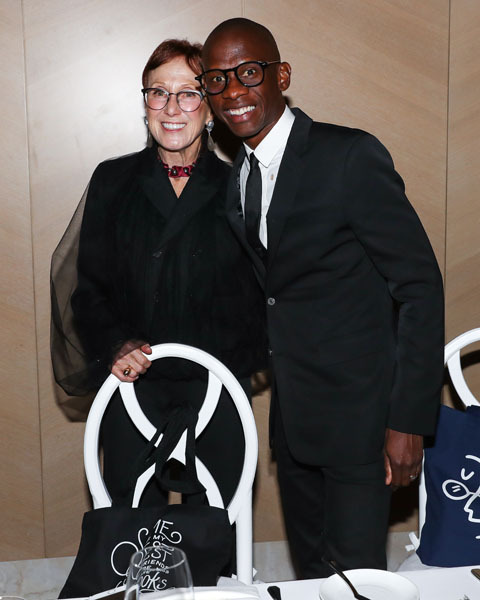 Diane Brown, RxArt Founder and President, hosted the 18th annualRxArt PARTY and auction at 432 Park Avenue, New York’s tallest and most exclusive residential building. 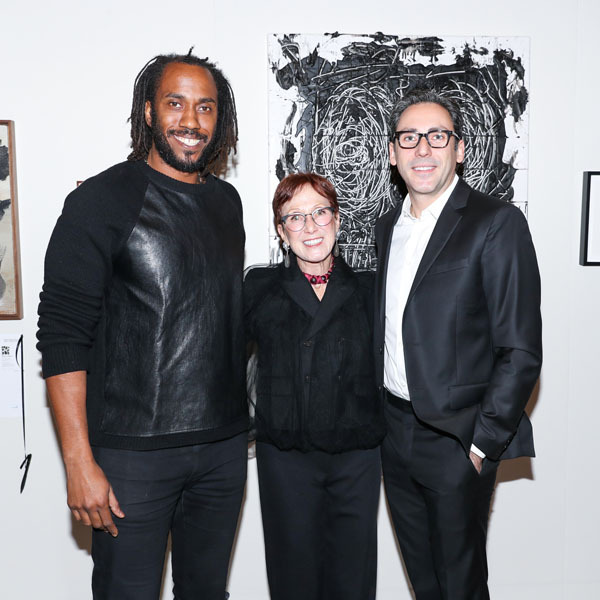 The evening honored artist Rashid Johnson and Warby Parker Co-Founder, Co-CEO and RxArt board member Neil Blumenthal. 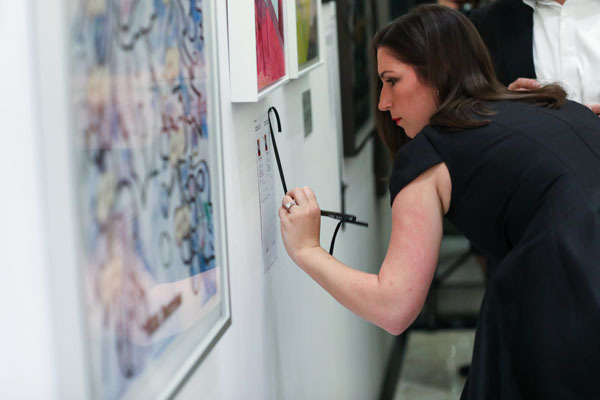 The RxArt PARTY raises critical funds to support the organization’s mission. These are vital to allowing RxArt to expand its mission of commissioning exceptional contemporary artists to transform pediatric hospital and health care spaces into engaging and inspiring environments full of beauty, humor and comfort. As the evening commenced, guests navigated the Rashid Johnson-inspired cocktail space, filled with greenery courtesy ofPlantShed, while previewing the auction artworks and enjoying specialty cocktails by The House of Suntory. Attendees gathered to celebrate the evening’s honorees, whereNancy Spector (Artistic Director and Jennifer and David Stockman Chief Curator at the Solomon R. Guggenheim Museum), presented Rashid Johnson with the RxArt Inspiration Award in celebration of his extraordinary multidisciplinary practice and creativity, and the engaging installation he’s creating for a new children’s clinic at Loma Linda University Children’s Health in Indio, CA. 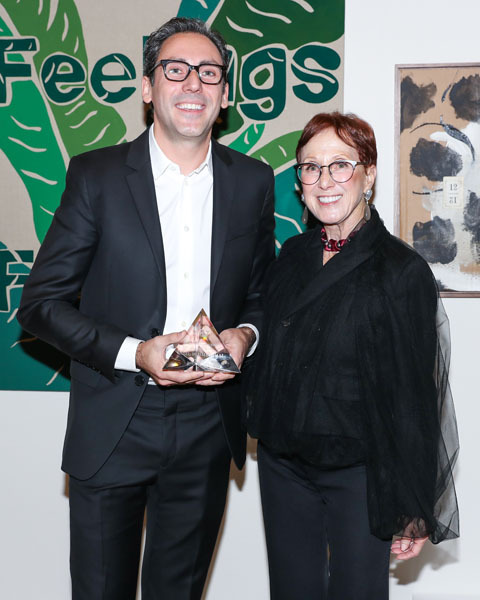 Neil Blumenthal was presented the RxArt Innovation Award by Diane Brown for his philanthropic work and steadfast guidance on the RxArt board. “I’m so pleased to be presenting the RxArt Innovation Award to Neil Blumenthal. We have been so impressed and inspired by Warby Parker’s commitment to giving back on a global scale. Neil has helped us exponentially expand our mission, and transform so many hospitals into inspiring places for children across the country,” said Diane Brown, RxArt Founder and President. 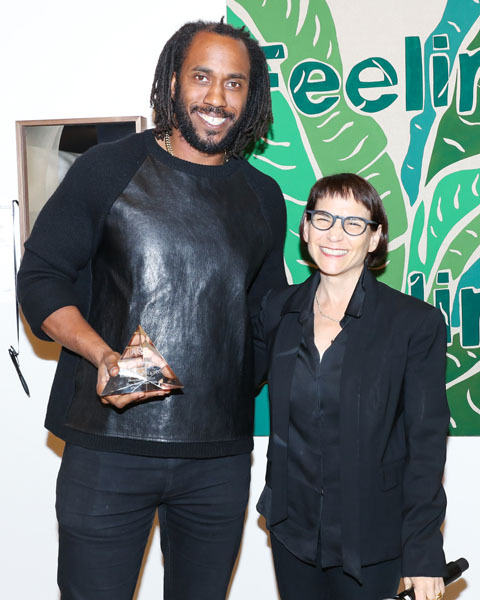 Rashid Johnson and Nancy Spector. 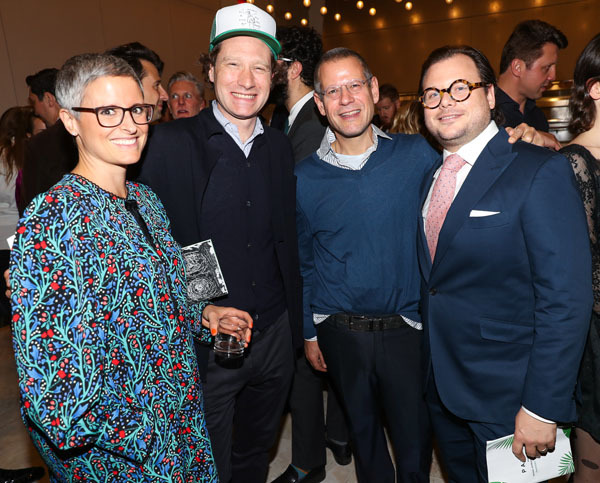 The beautifully elevated evening culminated with a successful live auction led by Sara Friedlander, Christie’s International Director, Head of Post-War & Contemporary Art in New York, in which each live auction work was sold. Auction artists includedRashid Johnson, Harold Ancart, Sanford Biggers, Marcel Dzama, Daniel Heidkamp, Sheree Hovsepian, Barry McGee, Joel Mesler, Angel Otero, Laura Owens, Maurizio Pellegrin, Ed Ruscha, and Lawrence Weiner. All proceeds from the auction aid RxArt in it’s continued mission of transforming children’s healthcare facilities into engaging environments that promote healing through visual arts by commissioning world-renowned contemporary artists, at no cost to the hospitals. Notable guests from the worlds of art, business, tech, fashion, beauty and medicine converged to support RxArt, including RxArt Founder and Executive Director Diane Brown; honorees Rashid Johnson and Neil Blumenthal; artists Isca Greenfield-Sanders, Sheree Hovsepian, Joel Mesler, Angel Otero, Maurizio Pellegrin, award presenter Nancy Spector; Christie’s International Director, Head of Post-War & Contemporary Art and auctioneer Sara Friedlander; benefit committee members Lidia Andich, Abby and Matt Bangser, Patrick Bradbury, Sarah Brown, Annie Burns and Benjamin Godsill, Andrew Craven, Dr. Richard Heller, David Kordansky, Serra Pradhan, Casey Weyand; model Lauren Layne; philanthropists and supporters of the arts Agnes Gund, Meyer Chetrit, Nicky and Philip Hoffman, Ally Lewis, George Merck; entrepreneur Troy Carter; and art world notables Vittorio Calabrese, Cristopher Canizares, Adam Cohen, Glori Cohen, Paul Judelson, David Rothschild, Kenny Schachter, and Joyce Varvatos. In the past 18 years, RxArt has completed over 40 projects with over 50 artists in hospitals throughout 17 cities in the U.S. RxArt produces every project at no cost to the hospitals. Every artist is provided with an honorarium and the chance to transform the lives of children as they heal. RxArt has collaborated with top contemporary artists from around the world, including Dan Colen, Urs Fischer, Keith Haring, Jeff Koons, Laura Owens, Rob Pruitt, Ed Ruscha, and William Wegman. 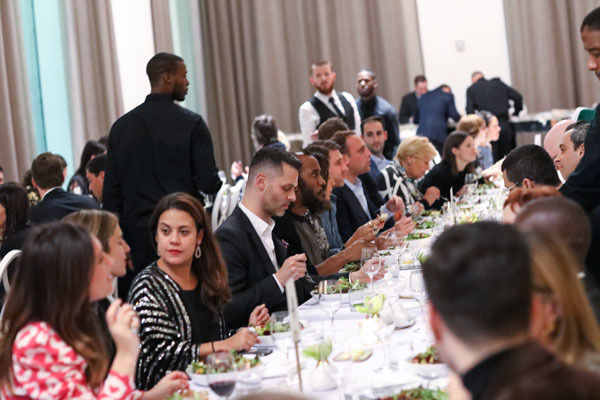 The RxArt PARTY is an annual fundraising event that connects leading artists, galleries, collectors, and leaders in business, tech, fashion, beauty and medicine for an evening that honors some of the most extraordinary artists and professionals today. 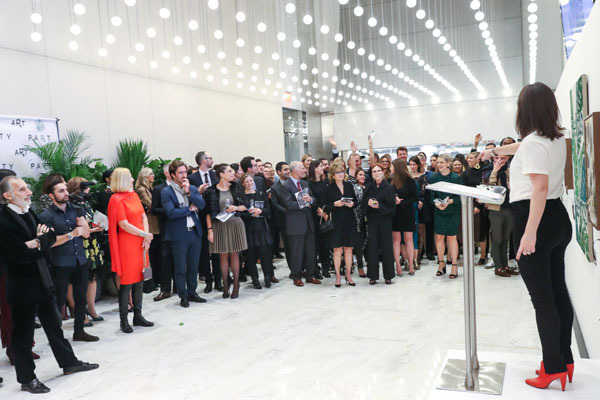 The funds raised at the gala are vital to allowing RxArt to expand its mission of commissioning exceptional contemporary artists to transform sterile healthcare facilities into engaging and inspiring environments full of beauty, humor and comfort.